Our latest addition to the detailing side of our operation, he has come to us from the automotive industry with 9 years detailing experience. So far he has proven to have a sharp eye for fine detail. In Andrew’s short time in aviation he has been bitten by the aviation bug and expresses his love already for what he is doing. Andrew currently has aspirations of furthering his post high school education. He has 2 daughters, Ella age 6 who loves gymnastics and Leighton age 1 who just loves getting into everything. Andrew’s girlfriend Brooklyn adds great value to his life and he is committed to marrying her in the future, yay for them! He is very thankful for Brooklyn’s knack as a mother and enjoys spending time with his family as much as possible. A personal point of interest is riding his BMX bike on lengthy rides. He is very pleased to be here were are very pleased he chose us as his current employer. Next time you’re in the neighborhood stop by and book a professional cleaning with Andrew or Dion. Graduated High School from Ansley Nebraska in 2009, and decided to go to Grace University to major in Youth Ministry and learn to fly from Advance Air during his spare time. Going into College he wanted to join the mission field of Alaska and become a bush pilot. He received his private license the spring of 2011 and Instrument license the following year. Between his junior and senior year he married his high school sweet heart Tessa. They married on a Friday and three days later they were on the mission field in Alaska. He was doing an internship through Kingdom Air Corps, and Tessa was a horse wrangler at Victory Ministry’s. They spent the summer there and came back and finished their senior years and graduated, also, that’s when he completed his Commercial and Flight Instructor licenses, as well as, working for Ford Storage driving a forklift. In 2014 they decided to go to Michigan so he could get his A&P licenses from SMAT (School of Missionary Aviation Technology). After graduating from SMAT in 2015 they moved back to Cozad Nebraska where he worked at Mid-State Aviation, and Tessa worked at Developmental Services of Nebraska. He worked at Mid-State for just over two years, his responsibilities ranged from full time A&P mechanic, part time flight instructor, summer time aerial surveyor, and a chemical loader for their Air Tractor 502’s. On December 29, 2016, Tess and Levi had their first kid, Elijah Liam Entz. Which changed a lot of things around the house, Tessa is a stay at home mom and Elijah is a very very active little boy. 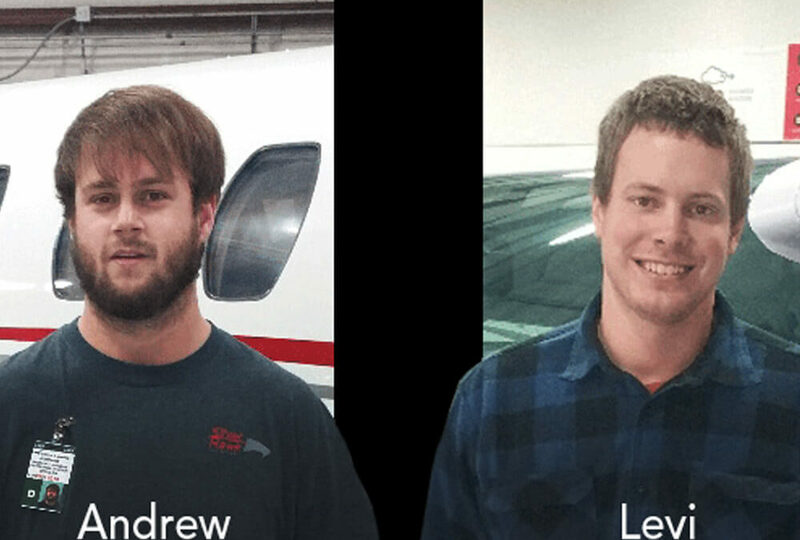 The following summer Tess and Levi decided it was time to move on from Mid-States aviation and time to move forward in his career of Aviation, so he gave Silverhawk Aviation a call and they said they were looking for mechanics. He came in, interviewed, and really liked what he saw. Silverhawk extended an awesome opportunity to go to work, advance his knowledge, experience, and career in the Aviation industry. We are very fortunate to have Levi here and are thankful he chose us to be his next employer. Next time you’re out and about give Levi a shout out and welcome him into the fold!